Trump met with Putin for three hours Monday before participating in a joint press conference in which Trump did not contest the Russian leader’s election meddling denials. U.S. intelligence agencies have unanimously concluded that Russia interfered in the 2016 campaign, most likely to help Trump’s campaign. Putin said that he hadn’t been aware of Trump’s visit to Moscow a few years before his 2016 election, which has been stained by accusations that Russians hacked and interfered in the campaign to support Trump. At a joint appearance in Finland with Vladimir Putin, Trump repeated the Russian leader’s denials about involvement in the election. President Donald Trump says Russian President Vladimir Putin made an “incredible offer” to allow Russian and U.S. investigators to work together on allegations of Russian cyber attacks. Trump says he has “great confidence” in his intelligence agencies who have concluded Russia interfered in the election. But Trump says Putin was “incredibly strong and powerful today” in his contention that Russia had nothing to do with election interference. Speaking during a joint news conference with Russian President Vladimir Putin in Helsinki, he reiterates that there was “no collusion” between his campaign and the Russian government. President Donald Trump and Russian leader Vladimir Putin say they are exploring ways to protect Israel from conflict raging near its border in Syria. The two leaders did not commit to any specific actions, but both said that ensuring Israel’s security was a priority. Israel is deeply concerned about Iran’s presence in Syria, where Iranian forces and proxies have been fighting on behalf of the Syrian government, which is also supported by Russia. Israeli Prime Minister Benjamin Netanyahu has appealed to both Trump and Putin to eliminate the Iranian presence, which the Jewish state regards as an existential threat. Russian President Vladimir Putin says he and U.S. President Donald Trump have agreed to continue detailed discussions on arms control issues. Putin said Russia and the U.S. should discuss a possible extension of the 2010 New START nuclear arms reduction treaty and the implementation of the 1987 Intermediate Nuclear Forces Treaty. Putin added that other issues that Russia would like to discuss in the arms control sphere are the U.S. missile defense plans and the weaponization of space. He spoke at their joint news conference wrapping up the Helsinki summit. He spoke at a joint news conference in Finland with the Russian leader after their summit in Helsinki. Many in the U.S. disagree with Trump. They say Putin is an adversary and note his country’s meddling in the 2016 U.S. presidential election. Trump, asked about a Russian gas pipeline to Germany, noted that the U.S. and Russia compete in the energy market. Trump criticized the pipeline during an earlier stop on his weeklong visit to Europe. Russian President Vladimir Putin has praised President Donald Trump for this efforts to resolve nuclear tensions with North Korea. President Donald Trump says in a statement that he directly addressed meddling by Russia in the 2016 U.S. election with Russian President Vladimir Putin. But the U.S. president is not condemning Moscow’s conduct publicly. The president did not elaborate on Putin’s idea. Putin said before Trump spoke that Moscow never interfered and will never interfere in the American electoral process. The summit comes days after the U.S. indictment of 12 Russian military intelligence agents for sophisticated hacking in the 2016 election. He says he’s sure that he and Putin will meet again often in the future. 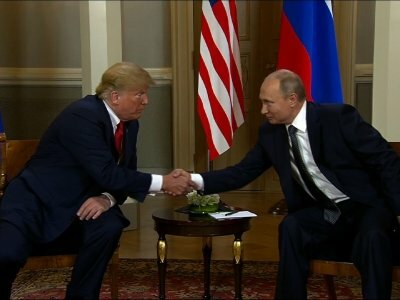 Russian President Vladimir Putin says the “so-called Russian interference” in the U.S. 2016 presidential election was brought up by President Donald Trump during their summit in Helsinki. Britain’s prime minister has launched a strong verbal attack on Russia even as President Donald Trump is sitting down with his Russian counterpart at the Helsinki summit. Theresa May told Parliament Monday that Russia’s leadership is committed to trying to undermine Western values on a number of fronts. She condemned what she claims was Russia’s use of a lethal nerve agent inside Britain, its shielding of the Syrian government, its support of Iran, and the spreading of “malicious fake news” on an industrial scale. May says she “welcomes” the summit but wants to see a change in Russia’s actions. She was reporting on last week’s NATO summit, which was dominated by Trump’s call for allies to spend more on defense. May backed this view, calling for spending hikes. Even before U.S. President Donald Trump and Russian President Vladimir Putin sat down Monday, Russia’s government signaled that the two leaders were on the same page. Russia’s Foreign Ministry tweeted “we agree” in reaction to Trump’s morning tweet criticizing U.S. “foolishness and stupidity” for the state of relations between the two countries. Trump has promised to raise Russian election meddling with Putin, but he did not do so publicly when he discussed the agenda as they first met on Monday. The two presidents are set to hold a joint press conference later in the day. President Donald Trump says he and Russian President Vladimir Putin have had a “good start” to their high-stakes summit in Finland. Trump is calling his meeting with Putin “a good start, a very good start for everybody” as the two leaders and their top advisers sat across the table from one another during a luncheon. It followed more than two hours of one-on-one discussions involving just the U.S. and Russian leaders, with only translators present. The White House had scheduled 90 minutes for that meeting. Trump was joined at the luncheon by Secretary of State Mike Pompeo, U.S. Ambassador to Russia Jon Huntsman and other top aides. After the lunch, Trump and Putin will appear for a joint news conference in Helsinki. The one-on-one meeting between U.S. President Donald Trump and Russian President Vladimir Putin is running overtime and has now passed the two-hour mark. A Finnish official said the two leaders were still meeting as of 4:09 p.m., two hours after they began their meeting in the Gothic Hall of the Presidential Palace in Helsinki. The White House had scheduled 90 minutes for the meeting, in which only translators are present. It’s not the first time the presidents’ talks have gone long. In their first meeting last year, they ended up talking for more than two hours. Midway through, first lady Melania Trump was sent in to help wrap things up. Trump and Putin continued to talk for another hour. Some demonstrators stayed near police barriers to try to register their complaints as the leaders sped by to the site of Monday’s summit at Finland’s Presidential Palace. Others marched by Helsinki landmarks, far away from the leaders’ gathering, but in clear view of curious onlookers and visitors to the city center. He says their discussions will involve trade, the military, missiles, nuclear weapons and China, including their “mutual friend” China’s Xi Jingping. He did not mention Russia’s meddling in the U.S. election. The meeting started about 45 minutes late following Putin’s delayed arrival to Finland. Russian President Vladimir Putin says it’s time to talk seriously with President Donald Trump about relations between their powerful nations and global problems. While Trump spoke more extensively amid incessant clicks of cameras, Putin said only that “the time has come to talk thoroughly about bilateral relations as well as various hotspots in the world.” He called the meeting part of “continued constant contacts” between the men. President Donald Trump has arrived at Finland’s Presidential Palace for a summit with Russian President Vladimir Putin. Monday’s meeting is being closely watched on both sides of the Atlantic, coming days after the U.S. Justice Department indicted 12 Russian military intelligence officers for their role in hacking Democratic entities during the 2016 presidential campaign. Trump says he hopes for better relations with the Russian leader. He faces bipartisan skepticism in Washington that his desire for warming ties is displacing concerns over Russia’s annexation of Crimea and other destabilizing actions. Putin’s motorcade included several other vehicles of the same Kortezh, or Aurus family. President Vladimir Putin has arrived late for his high-profile meeting with President Donald Trump — another display of the Russian’s leader famous lack of punctuality. Putin’s plane touched down in Helsinki 30 minutes later than planned, pushing back the start of his one-on-one talks with Trump Monday. In the past, Putin was late for meetings with Britain’s Queen Elizabeth II and Pope Francis, among many others. Often seen as a trick to throw his interlocutors off balance, Putin’s tardy ways appear to be more of a personal trait than a well-calculated strategy. Russian President Vladimir Putin’s spokesman says he hopes the summit with President Donald Trump is a “baby step” toward fixing exceptionally bad U.S.-Russian relations. Ahead of Monday’s meeting, Kremlin spokesman Dmitry Peskov told broadcaster RT that the men had no strict agenda but recognize their “special responsibility” for global stability. Peskov said the Russian leader respects Trump’s “America first” stance because Putin puts Russia first, but said the only way to make progress at the summit is if both sides are open to finding areas of mutual benefit. Meanwhile, the Finnish tabloid Iltalehti took the American first lady to task with a front-page photo tweaking her for an alleged “breach of etiquette” because she walked off of Air Force One in front of President Trump after they landed at the airport in Helsinki on Sunday night. Finland’s biggest newspaper has a message for Presidents Donald Trump and Vladimir Putin: Respect a free press. Daily Helsingin Sanomat has placed advertisements around Helsinki alluding to Finland’s reputation as a hub for a free press. The advocacy group Reporters Without Borders has regularly ranked Finland among the top in its “Press Freedom Index” — including the No. 1 spot two years ago. Trump regularly berates some news outlets as purveyors of “fake news.” Putin is regarded as creating a culture of violence that has led to the killing of some Russian journalists. Trump is meeting with Russia’s Vladimir Putin in Helsinki on Monday. Trump made the brief prediction Monday at a breakfast at Finland’s presidential residence in Helsinki. He was meeting with Finland’s President Sauli Niinistö (SAW-lee KNEE-nes-tuh) in the hours before his highly anticipated summit with Putin. Russia’s largely Kremlin-friendly TV networks, websites and newspapers portrayed Trump as a political maverick who is being unfairly targeted by his own compatriots. Commentators on popular Sunday night talk show “Vecher” or “Evening” said Putin goes into Monday’s summit in Helsinki as the stronger figure, notably coming off his hosting of the World Cup. President Donald Trump says the U.S. relationship with Russia “has NEVER been worse” as he prepares for a high-stakes summit Monday with Russia’s Vladimir Putin. That’s Trump’s favorite derogatory term for the special counsel investigation into Russian election meddling and possible ties to his campaign that has already led to a slew of indictments, including of a dozen Russian intelligence officers last week. Trump is also once again blaming his predecessor, Barack Obama, for failing to stop Russia’s efforts in the 2016 election. He says Obama “thought that Crooked Hillary was going to win the election,” so he did “NOTHING” about it when informed by the FBI.